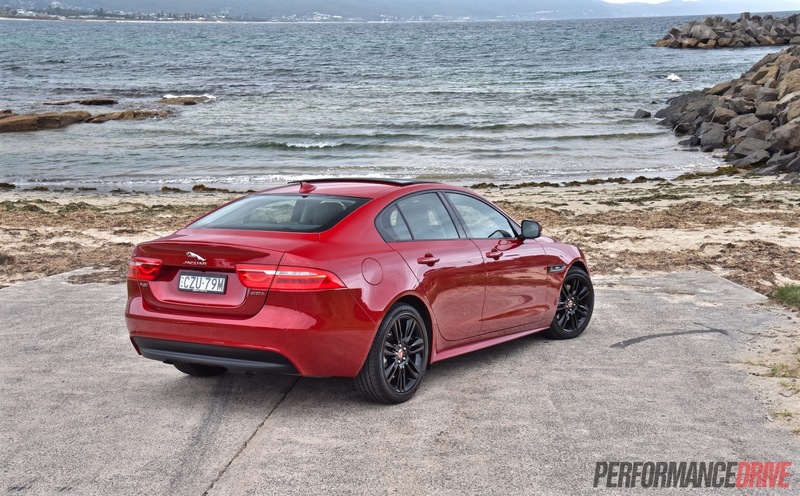 Watch out BMW 3 Series and Mercedes-Benz C-Class, the new Jaguar XE is out to get you. And on first impressions, it looks like it has more than enough ammunition to take you out. 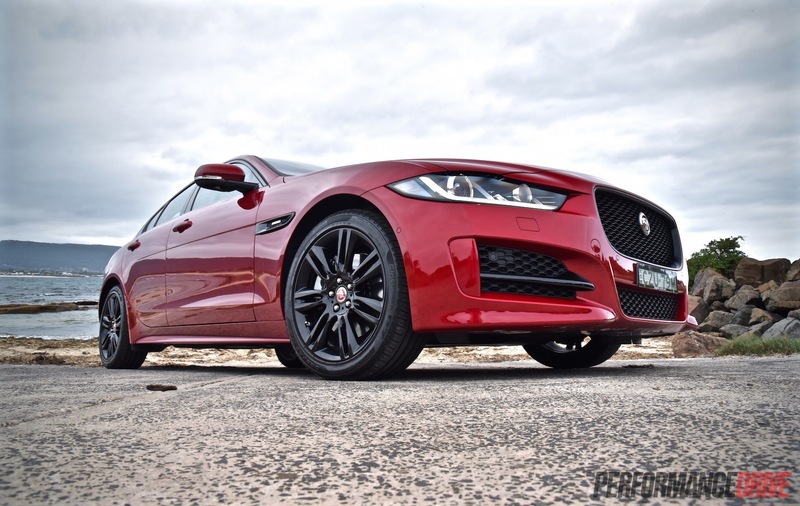 Welcome to the Jaguar XE. 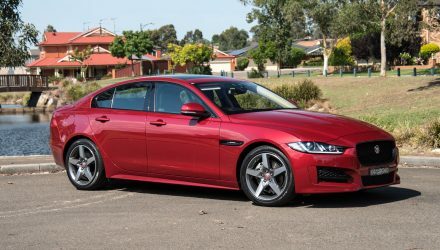 This is Jaguar’s new mid-size premium sedan, effectively a successor to the old X-Type of the late-1990s and early-2000s. 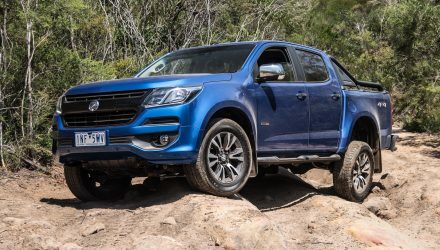 It comes with a wide variety of engine choices, including a 2.0-litre turbo-diesel generating 132kW/430Nm; two 2.0-litre turbo-petrol units offering 147kW/280Nm (called 20t) and 177kW/340Nm (called 25t); and a range-topping 3.0-litre supercharged V6 producing 250kW and 450Nm. Buyers can select from Prestige, R-Sport, and Portfolio trim levels, each providing a different exterior personality and interior theme. 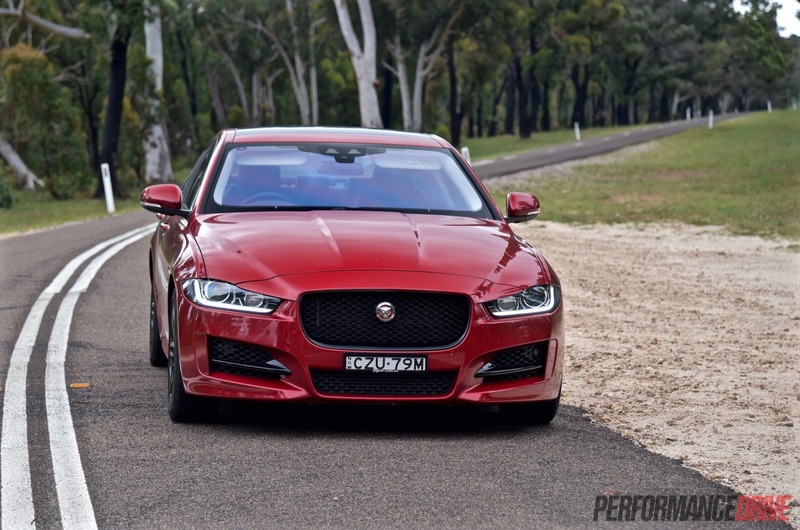 The top 3.0 V6 is only available as the XE ‘S’. Here we’re sampling the lower-output 2.0-litre turbo 20t in R-Sport form. Prices start at $60,400 for the base model and go up to $104,200 for the V6. 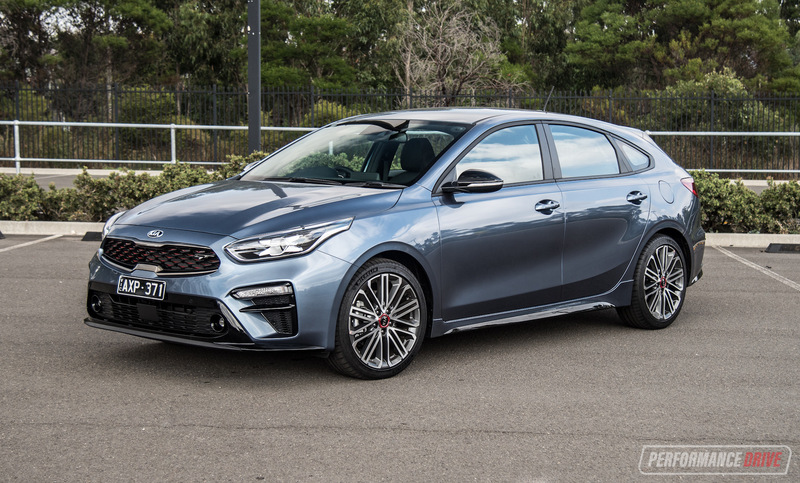 This example starts from $64,400, making it more affordable than the equivalent BMW and Mercedes offerings of similar spec. First up, let’s give a mention to the stunning design shall we. It has to be the nicest, most prestigious and most expensive-looking mid-size sedan in the class? It echoes the front end of the larger XF, with sinister headlights highlighted by swooshing LED daytime running lights. Around at the back the boot lid elegantly curves upwards in the middle, presenting a sporty and purposeful look, topped off with a lip spoiler for the R-Sport. Fortunately, the appeal carries across to the interior too. 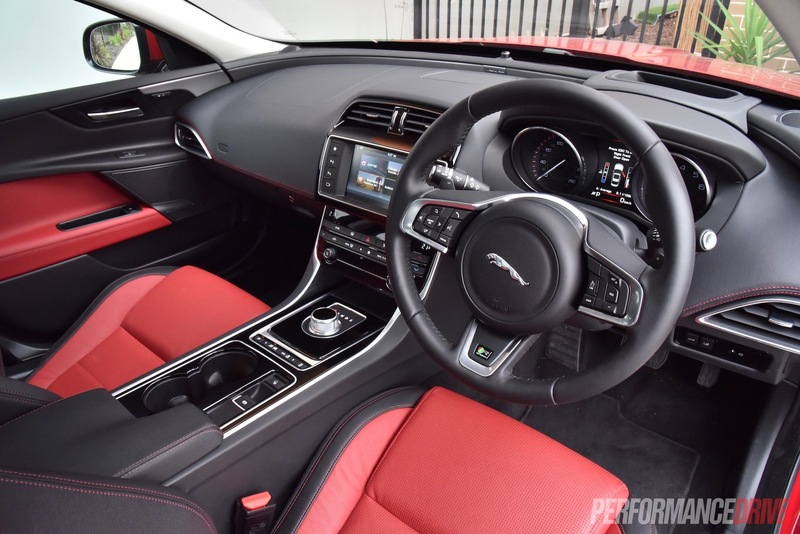 Jaguar has created a stylish, business-class suite in here, with modern furnishings and ergonomically-presented controls, all put together with high-quality materials. It all feels solid and extremely well made, with tight gaps and sound fit and finish. 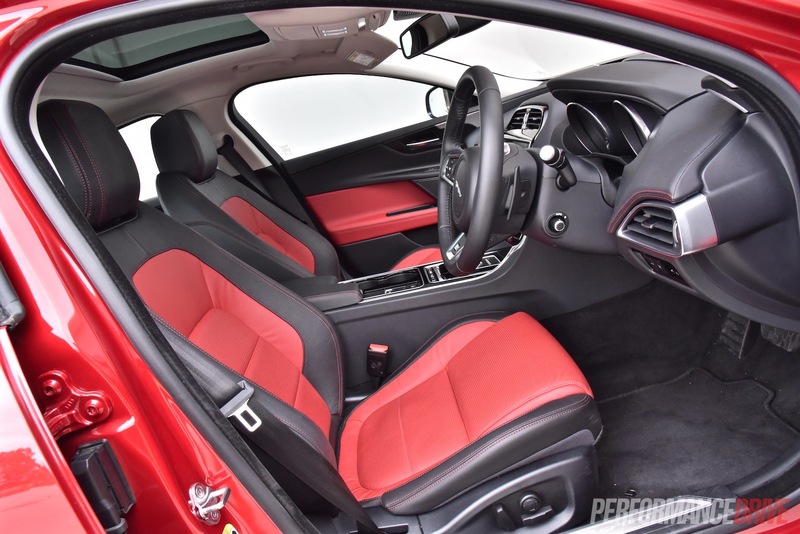 Interior quality and ambience is a particularly important criteria to pass in this category as the German rivals usually have very high and strict standards for this sort of stuff. 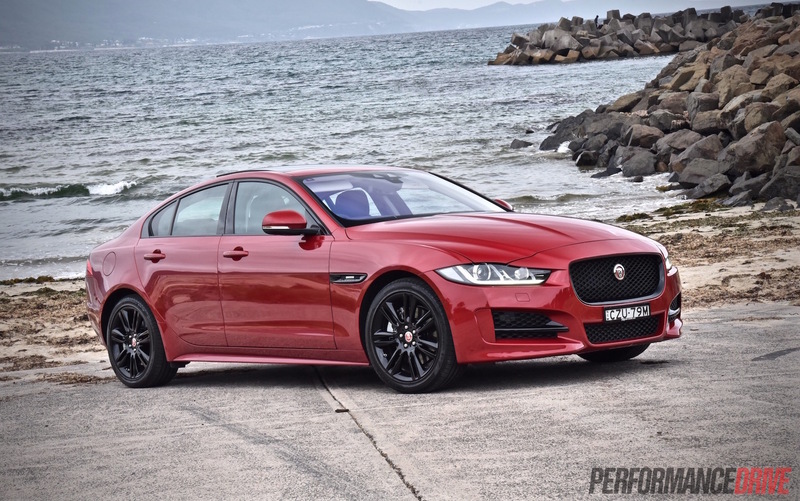 Jaguar has done an outstanding job with the XE. It’s a bonus that it looks much nicer inside compared with the boring German rivals, too. Rear seat space is at the smaller end of the class, with limited headroom despite cutaways in the ceiling. Centre passenger space is quite restricted as well, especially for legroom due to the chunky centre console and transmission tunnel. Headroom in the centre seat is even more restricted as the seat is slightly raised compared with the outer chairs. 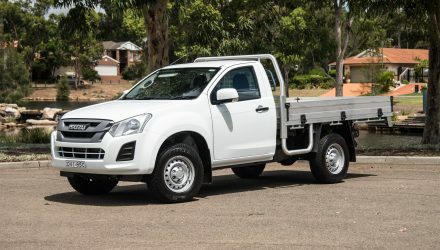 It’s adequate for four adults or three children across the back, but specifically compared with the key rivals it does fall a bit short. 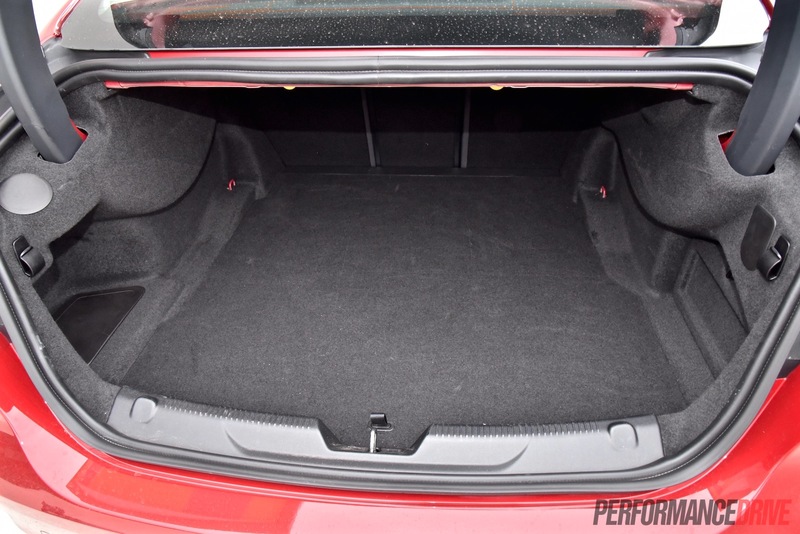 Boot space is rated at 450 litres, just down on the Audi A4, BMW 3 Series, Lexus IS, and Mercedes-Benz C-Class competitors, all of which offer 480 litres in sedan guise. It does come with a couple of bag hooks though so you can keep your shopping from rolling around. In the front there are no complaints at all. 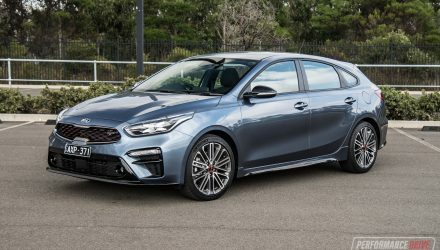 It offers an excellent driving position thanks to supportive and super-comfy 10-way power adjustable sports seats, along with an electrically-adjustable steering column (first in class?) 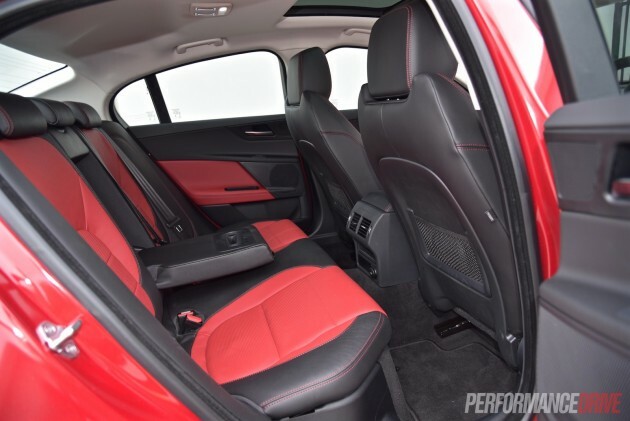 You can hunker right down into the seat for a sporty position or sit up high if you wish. And it feels rather special inside, with the R-Sport getting splashes of red tastefully spread around giving it an exclusive look. As usual, Jaguar offers a big range of options. 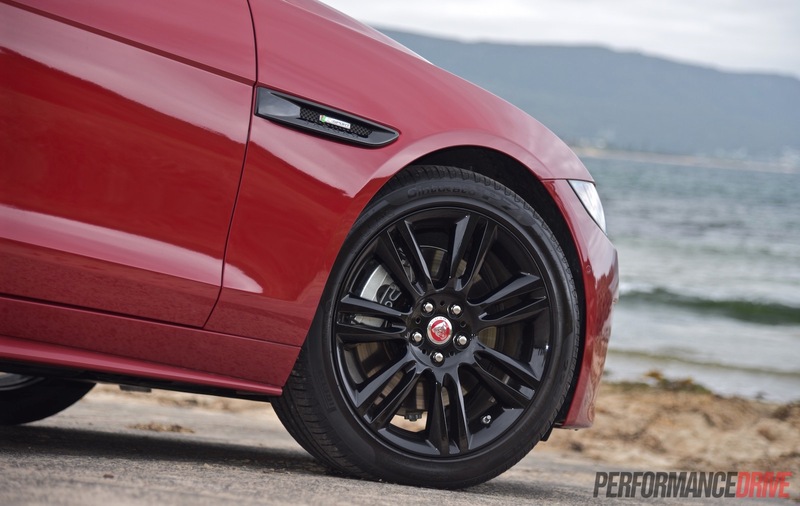 However, in the XE R-Sport it is extensively-equipped even if you tick no boxes. 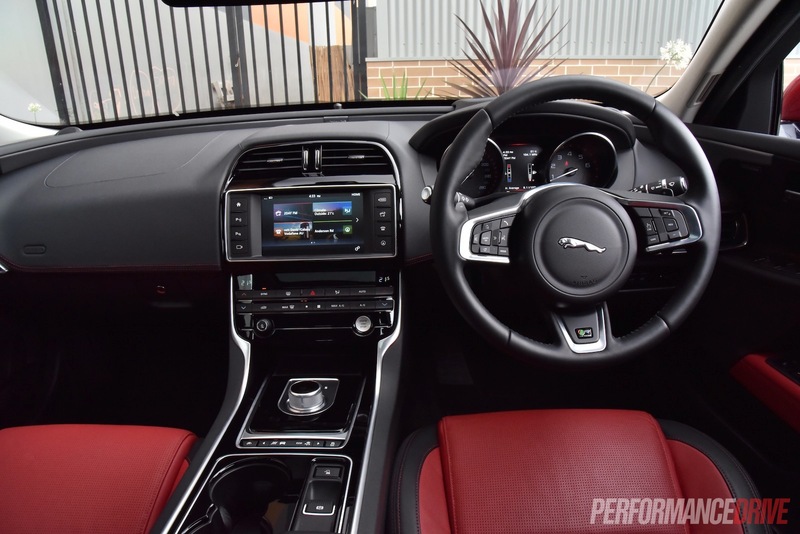 The 8.0-inch touch-screen multimedia system is free, incorporating Jaguar Land Rover’s much-improved, latest software and interface system. It comes with in-built apps allowing you to stream music from your phone, along with sat-nav and voice recognition. The screen also doubles as a display for the standard rear-view camera. 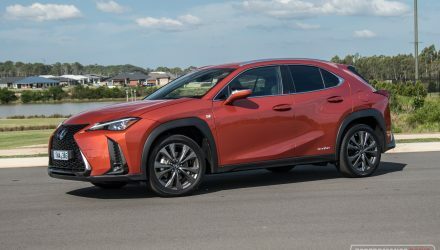 Some of the more modern conveniences, such as digital radio and head-up display are optional, requiring a $540 and $1770 premium, respectively. Digital radio is always nice to have but we wouldn’t bother with the head-up display. On this test car it threw back some nasty reflections from the sun on some angles, and at night the faintly-lit background section of the screen seemed low-budget and even a bit distracting. 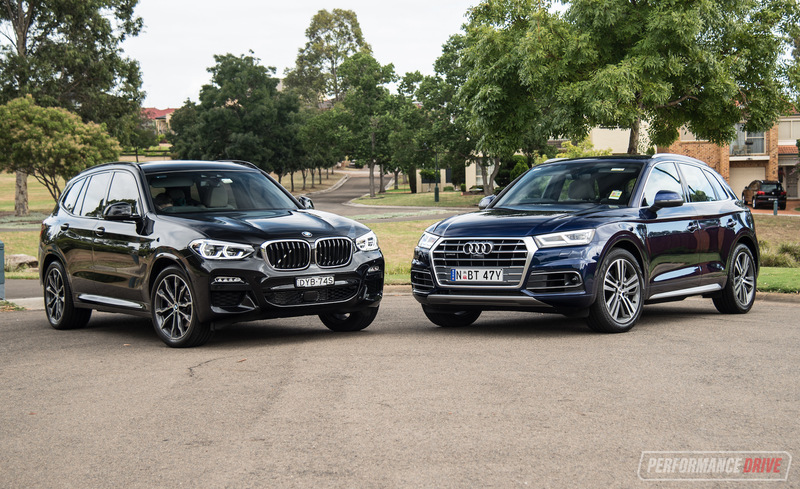 A 2.0-litre four-cylinder with a turbocharger seems to be the engine of choice for many carmakers these days. 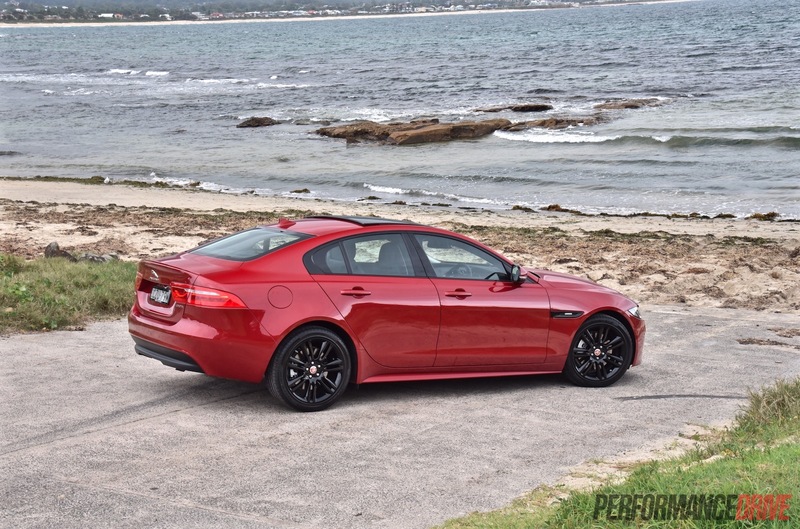 In the Jaguar it offers a surprisingly punchy character, even in this 147kW tune. 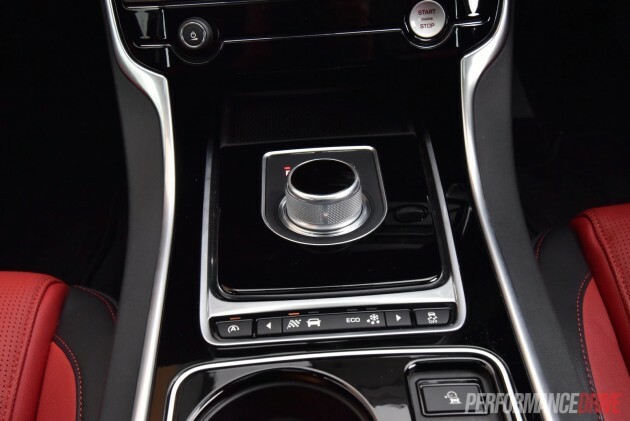 The unit doesn’t sound all that appetising from in the cabin, emitting a typical whirring or whining turbo thrum as opposed to a more exciting burble, whistle and flutter. There is some bass to it during lower revs. It also burps between upshifts at certain revs, or when upshifting with the paddles. From the outside though, it’s a completely different story. Never have we heard such an angry soundtrack from a ‘base-spec’ four-cylinder. 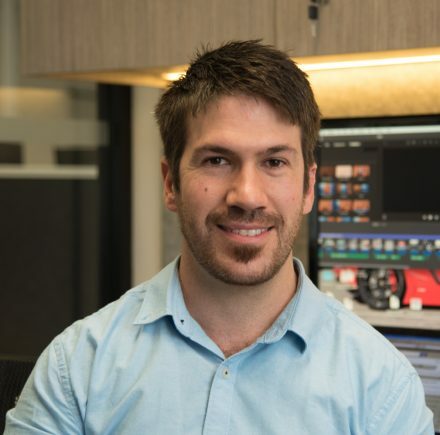 Jaguar has obviously infused some of its exhaust engineering expertise into the XE, with hints of F-Type inspiration heard at higher revs (see video below). 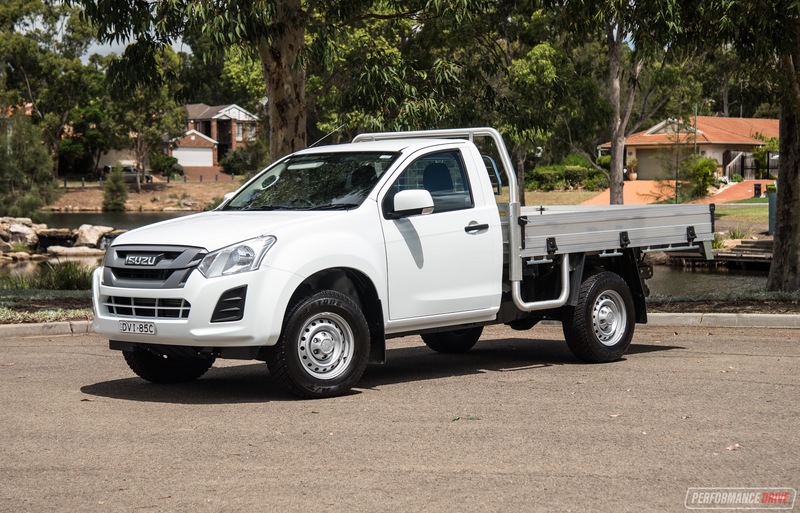 Mid-range torque is strong, pulling through in third gear from 2000rpm upwards, surging up hills with no lag or hesitation. 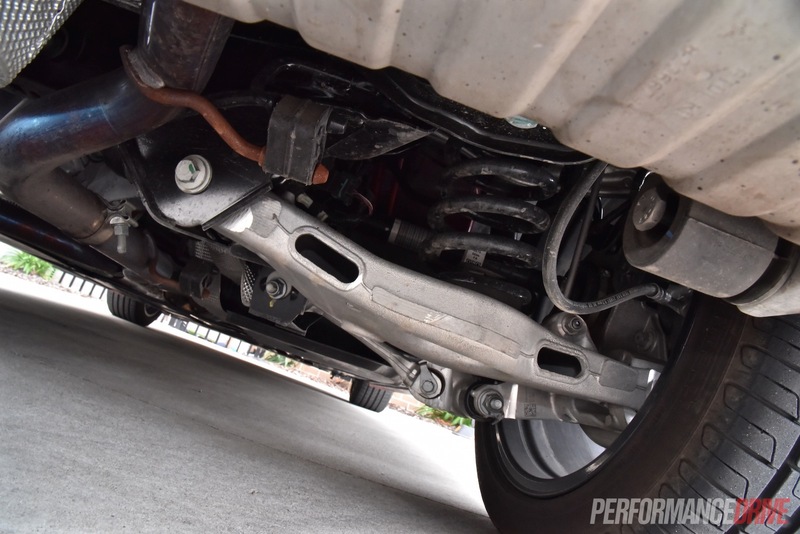 Revving the engine right up high doesn’t seem to offer any significant jump in performance. We found it to be most effective changing up gears at about 4500-5000rpm, or sooner if you prefer, for ultimate cross-country performance. 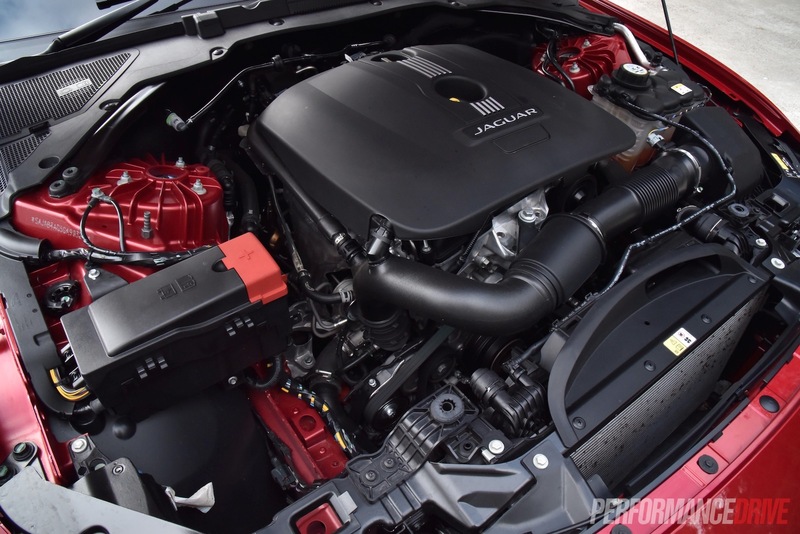 With peak torque available from just 1750rpm, this engine loves to surge through the gears. In any case, flat out from a standing start we timed 0-100km/h in a very respectable 6.8 seconds. 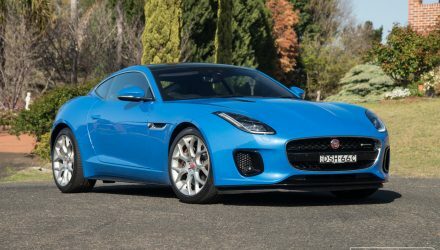 Weirdly, this is the exact time Jaguar quotes for the 177kW 25t version, quoting 7.7 seconds for this 20t – maybe there was a mix up with the badge on this car? Whoever is at the head of transmission and drivetrains at Jaguar Land Rover needs to be sat down and given a stern talking to. The XE carries on the hesitant and jerky transmission character that we found in the Evoque and the new Land Rover Discovery Sport. 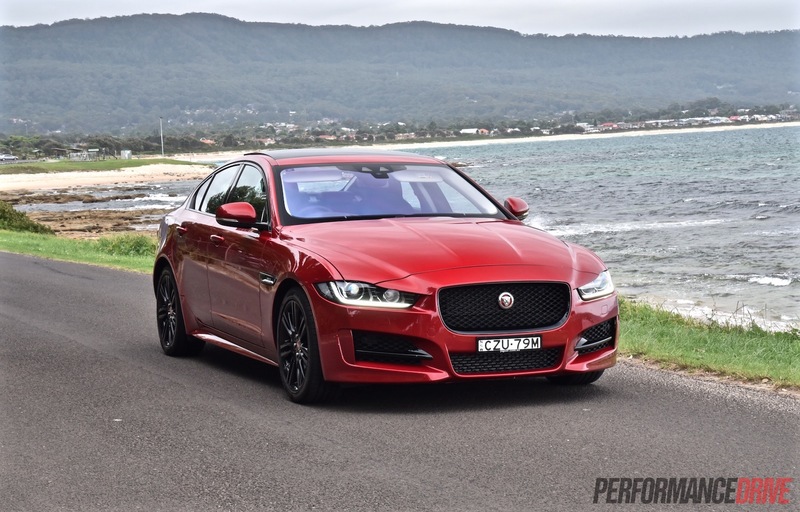 At first we thought the XE was using the same nine-speed auto as the SUVs, but in fact it uses the otherwise excellent eight-speed ZF unit that’s featured in a number of other vehicles. In the XE the calibration just doesn’t seem finalised. Let us try to explain. There are two transmission modes, D and S, and a manual mode with paddle shifters. In manual mode it is simply superb, changing down on demand and upshifting quicker than you can blink. However, in D the gearbox wants to jump up through the gears as soon as possible, often too soon – in the name of economy. On a number of occasions for us it tried to pull through roundabouts in fourth gear almost labouring the engine at 1200rpm at 30km/h before eventually kicking down. But by the time it automatically changes down it’s too late, resulting in a less-than-smooth drive experience. In S mode it does help a bit but then it revs out too high for normal driving. It’s as though D is a pure ‘eco’ setting. Funnily enough, there is a separate eco setting (and racy Dynamic mode) on the driver mode toggle, although it alters the throttle sensitivity and steering as well as the transmission mapping. As we said though, the gearbox itself is excellent it’s just the calibration that seems odd compared with the rivals. And this leads us to the economy. All that effort to work up through the gears as soon as possible results in a mediocre official average consumption of 7.5L/100km. 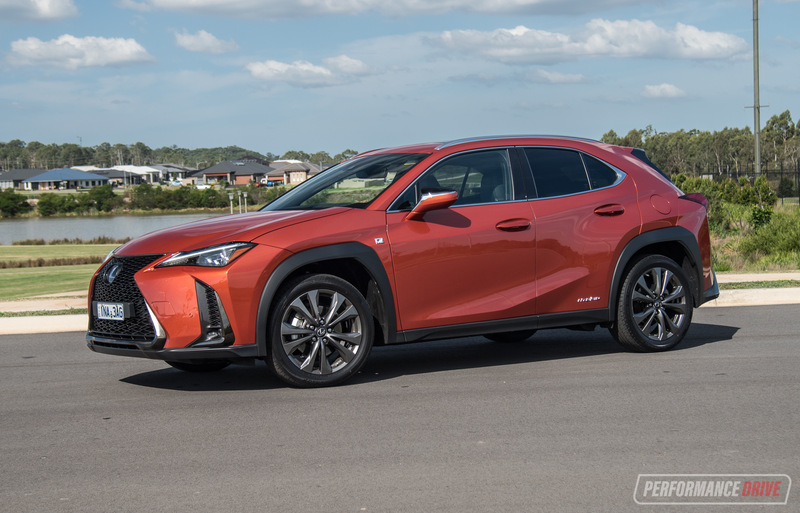 This matches the more powerful (180kW) Lexus IS 200t, but overshoots the 165kW Audi A4 2.0TFSI (6.7L/100km), the 180kW BMW 328i (6.3L/100km), and the 155kW Mercedes-Benz C 250 (6.0L/100km). In the real world you can expect an average of about 8L/100km, which is neither impressive or overly thirsty. 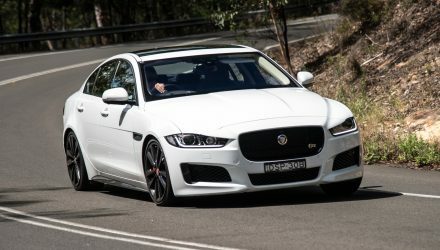 Now for the best part about the XE; the handling. Jaguar has done a fine job with the steering to ensure maximum driving enjoyment . It turns in with utter precision and holds on no matter how hard you push it. There doesn’t seem to be any understeer at all, and oversteer can be provoked but only by using momentum. At the back is an electronic-type torque-vectoring differential setup which seldom allows single wheel wheelspin. It doesn’t lock up like a mechanical limited-slip type. Instead, it brakes the inside wheel to help pivot the car around. And it works. Boy, does it work. You can have a lot of fun in this car, even zipping around roundabouts and through tight city streets. Part of the agility can be attributed to the light 1476kg tare weight. 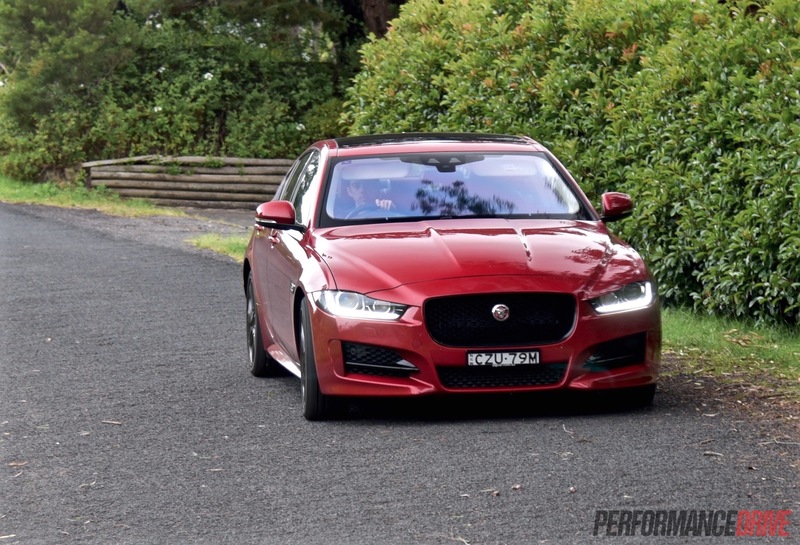 Overall, the XE is right up there with the 3 Series. We’re not going to say it’s better – like some of the patriotic British press – but it does equal the benchmark-setting BMW in terms of handling capability, driver enjoyment, and sheer grip. And that’s pretty high praise considering the BMW 3 Series has had decades to evolve. We can only imagine what the V6 version is like. 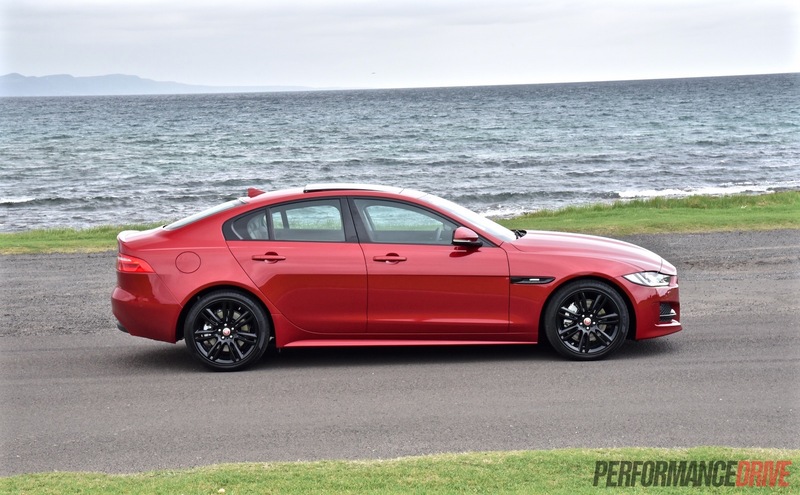 As an attempt at the very demanding mid-size sedan market segment, the Jaguar XE is a perfect fit. 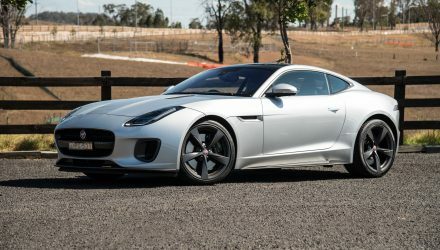 It offers Jaguar exclusivity in terms of unique styling and brand cache, while walking among the leaders in advanced in-car technology and luxury features. 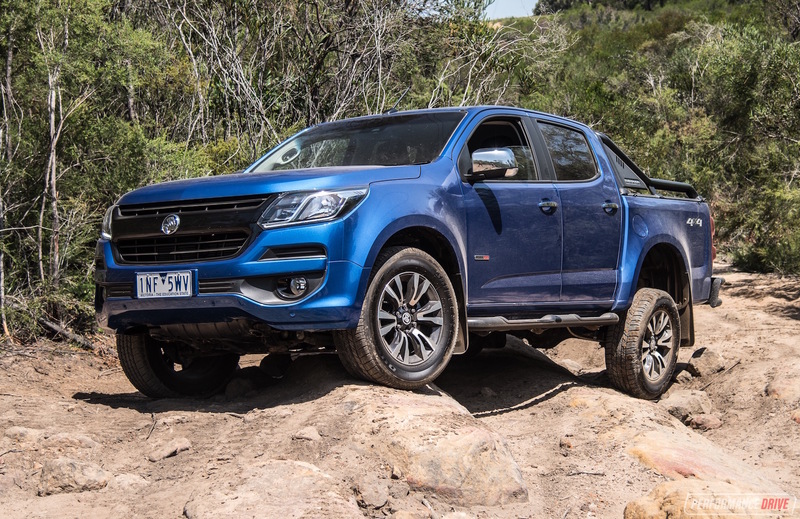 It also possess an outstanding chassis and steering that’s more skewed toward sportiness as opposed to luxury. Best of all, it’s not playing follow the leader here. It stands proud in the segment as a distinct, modern and quintessentially British proposition. If you’re in this space it is definitely worth a closer look. Be sure to check out the comfort-focused Prestige variants and the cracking V6 S to see what suits you best. – Exterior design; best looking in class?